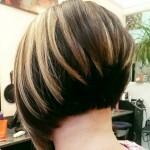 Still looking great, Sharon shows how fashionable and versatile a short cut can be. The hair is razor-cut in short layers with lightly textured ends, and carefully graduated sides styled onto the face creating a soft frame for the eyes. 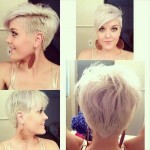 But on top, this pixie cut shows that it’s got a touch of the edgy punk about it! The tousled hair creates attractive height and texture around the front and crown. Styled up off Sharon’s smooth forehead, this is a great cut for any age because it keeps the focus on the top section of the face. And the fabulous movement in the messy top is beautifully highlighted by contrasting, but harmonised tones of wheat and dark ash-blonde! Find more hairstyles for women over 50.